The Asahi Series 83A Electromni actuator is suited for water and wastewater applications and other uses where liquids are controlled or moved via an actuated - to 2-inch ball valve. 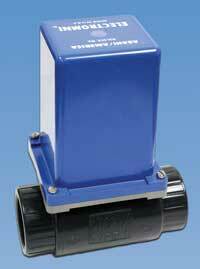 The Asahi Series 83A Electromni actuator is suited for water and wastewater applications and other uses where liquids are controlled or moved via an actuated ½- to 2-inch ball valve. It has a NEMA 4X-type enclosure, and the flanged cover and baseplate have a full-gasket nitrile seal to keep external water out of the enclosure. Four stainless steel hex-head screws fasten the cover and base halves together, and nitrile plugs cover the motor mounting bolts. A gasket or O-ring seal the valve body to the baseplate, and the 90-degree conduit has ⅜-inch threads for sealing integrity. The Series 83A is designed to be a direct replacement for the company’s Series 83.